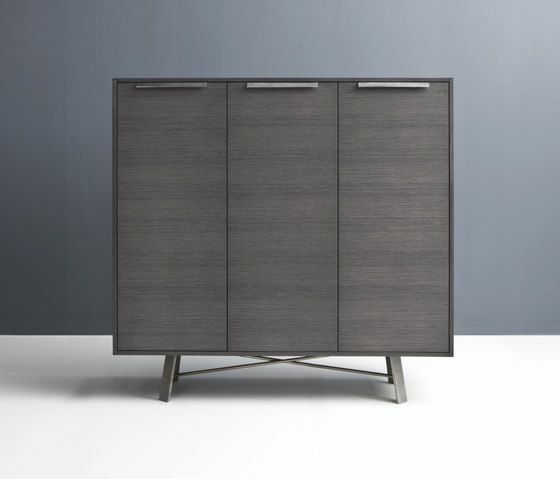 The big dimensions of the wooden box, which sits on the framework metal stand, lend to this tall sideboard a striking esthetic with a big containing capacity. Main feature of the collection is its framework stand, which supports and enhances the wooden element, whether being the sideboard or the thick table top. The precious brushed and smoky wooden finishing in different shades and the oxidized lead and bronze metal finishing gives these products a slight vintage touch complementing its contemporary design in a unique way. Attention to details and the accurate use of the materials are an expression of Former’s DNA.